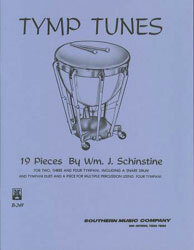 An excellent collection of timpani solos for 2, 3 and 4 drums. For 2 drums: Pauken Parade; The Copper Bowls; Kettle Kaper; Tall Tale for Tympani; Tympanic; Swingsation; Jazz a Little Waltz; Tympani Bossa Nova; Academic Episode. For 3 drums: Tymtation; A Scary Scherzo; Experience in Six; Dresden Dance. For 4 drums: Slightly Latin; Cake Walk for Kettles; Fanfare for Four Timpani. For snare drum and timpani duet: Dubious Debate. For multiple percussion: The Tympercussionist. All are unaccompanied.